Over millions of years, retroviruses have been incorporated into our human DNA, where they today make up almost 10 percent of the total genome. A research group at Lund University in Sweden has now discovered a mechanism through which these retroviruses may have an impact on gene expression. This means that they may have played a significant role in the development of the human brain as well as in various neurological diseases. Retroviruses are a special group of viruses including some which are dangerous, such as HIV, while others are believed to be harmless. 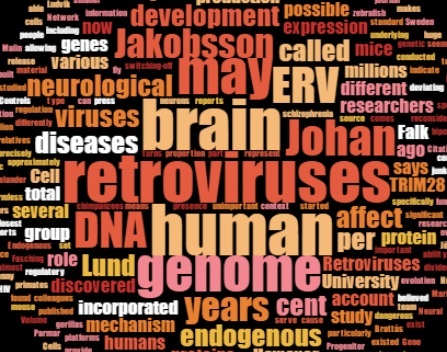 The viruses studied by Johan Jakobsson and his colleagues in Lund are called endogenous retroviruses (ERV) as they have existed in the human genome for millions of years. They can be found in a part of DNA that was previously considered unimportant, so-called junk-DNA a notion that researchers have now started to reconsider. "The genes that control the production of various proteins in the body represent a smaller proportion of our DNA than endogenous retroviruses. They account for approximately 2 per cent, while retroviruses account for 8-10 per cent of the total genome. If it turns out that they are able to influence the production of proteins, this will provide us with a huge new source of information about the human brain", says Johan Jakobsson. And this is precisely what the researchers discovered. They have determined that several thousands of the retroviruses that have established themselves in our genome may serve as "docking platforms" for a protein called TRIM28. This protein has the ability to "switch off" not only viruses but also the standard genes adjacent to them in the DNA helix, allowing the presence of ERV to affect gene expression. This switching-off mechanism may behave differently in different people since retroviruses are a type of genetic material that may end up in different places in the genome. This makes it a possible tool for evolution, and even a possible underlying cause of neurological diseases. In fact, there are studies that indicate a deviating regulation of ERV in several neurological diseases such as ALS, schizophrenia, and bipolar disorder. Two years ago, Johan Jakobsson's team showed that ERV had a regulatory role in neurons specifically. However, this study was conducted on mice, whereas the new study published in the journal Cell Reports was made using human cells. The differences between mice and humans are particularly important in this context. Many of the retroviruses that have been built into the human DNA do not exist in species other than humans and our closest relatives gorillas and chimpanzees. They seem to have incorporated themselves into the genome some 35-45 million years ago when the evolutionary lineage of primates was divided between the Old and New World. "Much of what we know about the overall development of the brain comes from the fruit fly, zebrafish, and mouse. 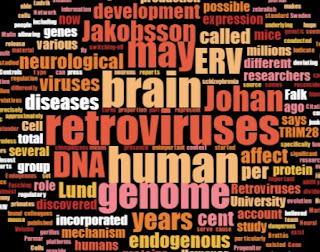 However, if endogenous retroviruses affect brain function, and we have our own set of these ERV, the mechanisms they affect may have contributed to the development of the human brain", says Johan Jakobsson. Citation: Brattås, Per Ludvik, Marie E. Jönsson, Liana Fasching, Jenny Nelander Wahlestedt, Mansoureh Shahsavani, Ronny Falk, Anna Falk, Patric Jern, Malin Parmar, Johan Jakobsson. "TRIM28 Controls a Gene Regulatory Network Based on Endogenous Retroviruses in Human Neural Progenitor Cells." Cell reports Volume 18, Issue 1, p1–11. Adapted from press release by Lund University.